From the Investigator: Sherlock's Most Unique CasesSherlock Investigations Inc.
After two years with our company, Samantha Castillo has had a good sampling of what field work as a Private Investigator can offer. Samantha came to us from the Detroit Police Department after working as a Crime Analyst, and is an alumnus of Central Michigan University and Michigan State University. Her transfer from the public to the private sector has been benefited her work in many ways, and she continues to learn and adapt with every new challenge this industry brings. This series aims to address the most unique cases that Private Investigators run into, as well as the impressionable outcomes that many of our cases hold. Let’s get to know our first interviewee, Samantha, a little better! 1. How did you get into surveillance? I was looking for an opportunity to do more boots-on-the-ground type of work. Coming from a background that involved a lot of research, data and computer time – I found myself wanting to expand my skills set to include real world applicability. It was about two years ago that I decided to pursue private investigations and I have not regretted it one bit. Sometimes a change of scenery can help you grow as a person. 2. What is your opinion of the career now versus what you used to think the job entailed? How does your view differ from the public view of the job? There is definitely a level of technicality that I was not expecting. The amount of precision that goes into camera work, human interaction and report writing is substantial. It takes a considerable amount of time to learn how to do this job satisfactorily. Many people think that they can do this job, but the truth is that it is not for everyone. Previously, I believed that the job would require little to no energy, but honestly you need a special kind of stamina in order to do this. I don’t think you know that you have that special thing, until you actually perform the job in real time. 3. Are there any cases you worked on, that come to mind as very “unique “? Why is that? Yes, I had a child custody case that supposedly included an element of neglect. The wife of a man with two young kids, they were both younger than 5, was convinced that her soon to be ex-husband was not taking care of the children when they were in his custody; she claimed that they were always hungry, dirty or hurt when they were returned home. While following this man, I was sure that I would see some unsavory behavior all day. Turns out they were hungry, dirty and hurt because he kept them busy all day long with swimming, baseball, etc. They were definitely fed, and he even bought groceries – which did not include any junk food. At one point I witnessed him run full speed to grab the youngest child from running into traffic. This was unique in my mind because many people assume that just because we are following someone, that they are assumed to be guilty. 4. 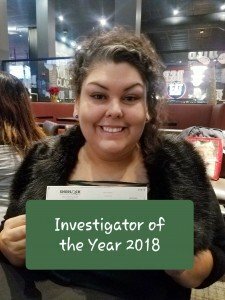 What is one of your most successful “wins” as an investigator? A case where you made a positive difference in outcome. Like I previously stated, we cannot assume anyone is guilty. We can only report back what we observed, even if it is not what our client is expecting to happen. The case with the two young children would be a win in my eyes, as we did not find any positive signs of abuse or neglect. As investigators, we need to celebrate a lack of evidence, especially in those types of cases. 5. What is your advice for other or aspiring investigators? My biggest advice would be to ask yourself if you are a “people person”. It may be surprising, but the amount of general public, law enforcement, subjects and even clients that you come in contact with on this job are relatively high. Keeping your cool and being able to read another person is vital. 6. What is your advice for our clients or potential clients on expectations for each case? You cannot expect any one particular outcome. The most efficient way to gauge someone’s behavior is by establishing a pattern; this can take days or even weeks depending on someone’s level of activity. Patience is needed if success is wanted! This entry was posted on Thursday, March 7th, 2019 at 9:15 am and is filed under Uncategorized. You can follow any responses to this entry through the RSS 2.0 feed. Both comments and pings are currently closed.